Remember the last time that little voice in your head said, “I can’t”? When you decided not to run because you weren’t strong enough or didn’t feel like you could go that extra mile? We’ve all been there. And for some, that voice is a bit louder than we’d like. Every once in awhile, we come across a person so inspiring, that voice goes silent. Waldon Adams is one of those people. When you envision the embodiment of heroism, your mind may not necessarily conceive a 55-year-old AIDS patient who spent more than 30 years living on the streets of Washington D.C. To many, however, Waldon has become a source of inspiration fit for a cape. Waldon began his journey battling addiction at the age of 9 when he became hooked on the liquid medication prescribed for his asthma. At 17-years-old, he was in an accident that resulted in the loss of fingers and a piece of his left hand, leading to a spiral of addiction and depression. This experience led to many stays in psychiatric hospitals and an inability to hold down a job. In 2004, Waldon experienced another setback when he was diagnosed with HIV, which has since transitioned into AIDS. This is not a Cinderella story. This is the story of a man who never got a fairy godmother, but found the power to thrive within himself. He had every reason to say “I can’t,” but didn’t. To mitigate the effects of his medication, Waldon began jogging around his hospital bed. As he began to run in ever-widening laps, he discovered running had a significant impact on his physical and mental wellness. He was hooked, but this time to something wonderful. Since that day, he has run 15 marathons, 25 half-marathons, 20 10k’s, and 21 5k’s. Now, he’s training for his first ever 100-mile endurance run. With mental strength at the core of his perseverance, he’s been using RockMyRun to power through the tougher parts of his training. His favorite stations? 10K4MK Home Run and Run The World. “I don’t know how I’d get through the 12-hour treadmill session without RockMyRun!” said Waldon with a chuckle. At this point in his journey, Waldon has gone from overcoming personal obstacles to becoming a source of inspiration for people experiencing similar challenges. With Miriam’s Kitchen, a non-profit organization in D.C. that seeks to end veteran and chronic homelessness, he works as the first ever Advocacy Fellow working to secure housing vouchers for people living on the streets. “I know how it feels, so it’s great to give back,” he said. He humbly credits running and Miriam’s Kitchen with much of his success. “I truly believe that running and Miriam’s Kitchen saved my life. Running helped me regain control, and Miriam’s Kitchen restored my dignity and supported me on a path to finding a home,” he said. 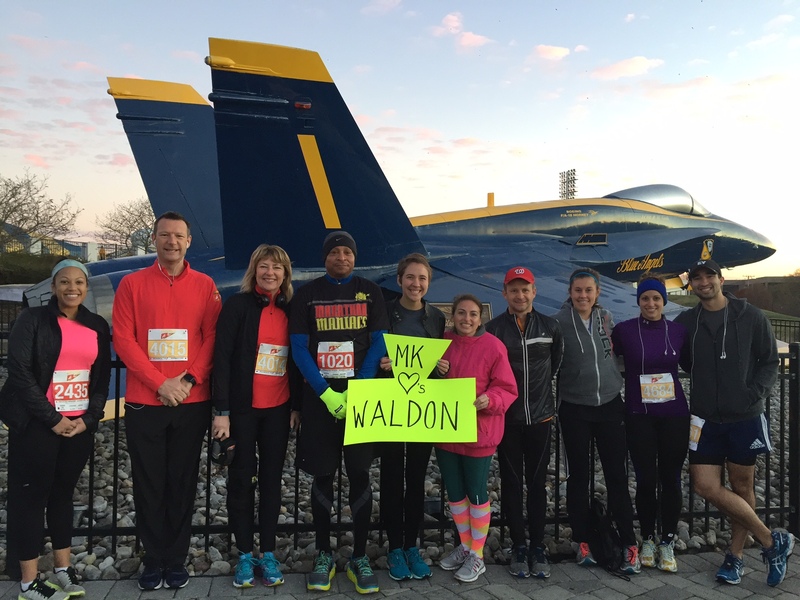 Want to join Waldon in a run and help him raise money to end veteran and chronic homelessness? Join Team MK and their sponsor, Routeam, for the annual 10K4MK event in Annapolis, MD on November 19, 2016 (in person, virtually, or as a “sleepwalker”!) and use the code WALDON16 at checkout to donate 10% of your entry fee to Miriam’s Kitchen. Waldon will be out there listening to his favorite 10K4MK Home Run station. How about you?